This post has 2,556 views. One of my tasks when I returned home was to help my parents shop for a new car. My family had a 2000 Toyota Echo that served us well for over a decade, but the little problems are starting to add up and it was about time to get a new car. My parents needed a daily commuter, so the requirements were that the car is good on gas, is reliable, can fit into our small garage, but is bigger than the little Echo. 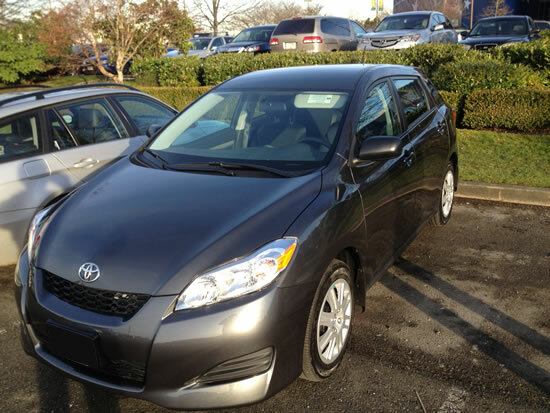 In the end, my parents purchased a grey 2013 Toyota Matrix base model. My parents’ new Toyota Matrix. The current Matrix model has been around for a couple of years. It doesn’t have the greatest ratings anymore since competitors have newer models in the segment, but my family trusts Toyota’s reliability, and the Matrix is pretty tall and roomy for a compact hatchback. It’s not that much larger than the Echo, but it’s a little longer and wider which makes a difference especially in the back. The Matrix fits into our narrow garage, albeit the parking is a little more difficult than before. And the 1.8 L engine, which may consume a little more fuel than the Echo, is still pretty good on gas. With the new Matrix, we finally have a car that has power windows and locks and keyless entry. The Matrix is the third car my family has had, after the Echo and a rust-riddled 1990 Ford Tempo that was our first car. Hopefully the new car will remain problem free for even longer than the little Echo.